Every Christmas, we celebrate the season in both Riverton and Kanab with a few simple activities. On Thursday we held our Riverton lunchtime festivities. The highlight for me is listening to our Stampin’ Singers, a very talented group of employees who practice for weeks and then perform several songs for us (this year they did four). They always seem to find songs I’ve never heard, and I love hearing them. This year was no different, and I’ve actually included a short video of part of one song (That Child, That King), which I loved! Click here to see it. We also had hot chocolate and doughnuts, and I must admit I’ve now fallen in love with a new doughnut. I’m kind of a Krispie Kreme fan, but I think I’m transferring my allegiance to Dunford, especially the Dunford glazed! Today in Kanab we had our traditional potluck Christmas lunch. We can still do that because our numbers in Kanab are small enough that it works. I enjoy spending time with our wonderful employees at Kanab, and today was no different. There is a warm, cozy feeling because everyone pretty much knows everyone. Of course, because it’s all about food for me, I also look forward to the potluck part of this activity. My favorites were the homemade root beer (I’m not a soda fan, but I was disappointed when it was gone), the pumpkin roll (I don’t think I’ve tasted one since high school, and it brought back lots of fond memories! ), and the homemade cranberry sauce (never even tasted it before and it was tasty!). At both Riverton and Kanab, we handed out service awards to our employees who have been with us five, ten, and fifteen years. This is also a highlight for me, and I love the chance to thank these loyal employees for all that they do for us! 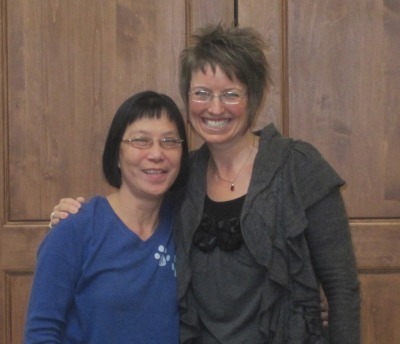 We had two employees—Darlene Davie in Riverton and Monica Domis in Kanab—who have reached the 15-year mark. They got extra-special hugs, and I hope they’re both around for another 15 years at least! Although I wasn’t able to celebrate the holiday with the employees in each of our offices around the world, we all got together for a few minutes over the phone lines. After our phone call yesterday, our Germany office sent this photo to me, and it made me smile a big smile. I must print it and put it where I can see it often!